A famous Japanese artist or celebrity once said that the Japanese do not appreciate what they have until foreigners validate them. The fact it took a foreigner to conserve some of rare Japanese flowering cherries from extinction reinforces this telling comment. 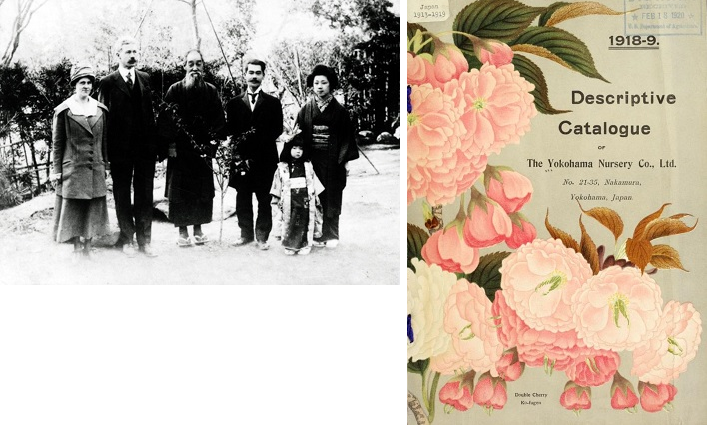 Naoke Abe’s The Sakura Obsession (US title) is an account of British horticulturist Collingwood Ingram whose evangelical zeal for Japanese flowering cherries led to their conservation. Naoke Abe, like her Japanese compatriots, is aware of the sakura’s dominance in her culture. She writes movingly about standing under the flowering cherry each April for the annual photograph. Each photograph marked a new rite of passage in her life as it did for other Japanese. However, it was after her move to UK in 2001 that Abe became curious about Japanese cherries, which were multi-colored and flowered at different times in English gardens. Her line of inquiry plunged her deeper into the investigation of the tree and its cultural implications. Aside from her Japanese heritage, Naoke Abe is well positioned to write the book. She had worked as a political journalist covering the Japanese prime minister’s office, the foreign and the defense ministry for one of Japan’s largest newspapers Mainichi Shimbun. Having navigated the notoriously bureaucratic Japanese government for reporting has given her an understanding of the country’s history that has colored the role of Sakura. Her UK base gave her exposure to the rich horticultural heritage, namely the plants and gardens that linked to Japan. Abe connected to the Ingram family, giving her access to archival material that shed light on Collingwood Ingram and his history. Beauties on a Veranda among Cherry Blossoms from which a Samurai is Departing c. 1800 by Utagawa Tokoyuni (The Metropolitan Museum of Art Collections): the diversity of flowering cherries reached their apogee when each feudal lord competed with each other to cultivate beautiful gardens often within their dwelling courtyards. The domestication of Japanese cherries is nearly as long as Japan’s history – beginning in the Heian period, preceded only by six periods. The Heian period saw the rise of the samurai class and the culmination of the Japanese imperial court, which led to patronage of arts. Aristocrats and artisans looked towards their landscapes for aesthetic inspiration, and the Japanese cherry, resplendent in full bloom, was an obvious candidate. Japan’s mild temperate climate, generous rainfall, and volcanic soils converged to create an ideal center for native cherries. Most cultivars are descended from Prunus campanulata, P. incisa, P. serrulata, P. sargentii, P. spachiana (syn. P. subhirtella), and P. speciosa. Heian’s peaceful times allowed for horticultural pursuits during which the aristocrats vied with each other. The political and civil unrest that followed subsequently did not permit the same ascendency of gardening until peaceful times returned in the Edo period. 102 year old Prunus sargentii at the Winterthur Garden, Delaware. The old age of these trees still defy the literature about the flowering cherries being highly susceptible to insects and diseases. Named for the first director of Arnold Arboretum Charles Sprague Sargent, this cherry is native to Japan and Korea. 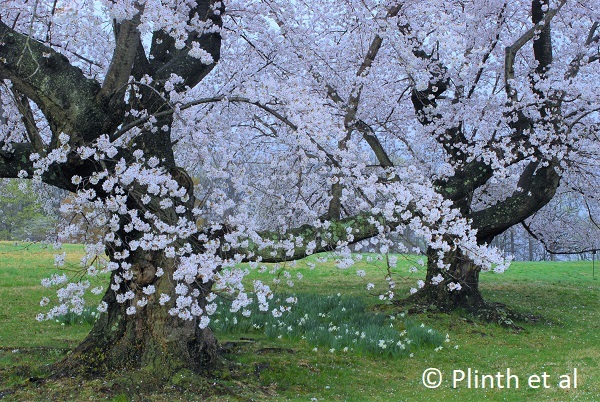 However, it is not common in gardens, having been superceded by the Yoshino cherry (Prunus x yedoensis). Forced to abandon its seclusion, Japan underwent a rapid period of industrialization and Westernization that propelled it ahead of its Asian neighbors. Japan’s militarism began to morph in a cultural hegemony that pervaded all aspects of the country’s populace. Political machinations subverted the cherry from a symbol of renewal and life to that of glorious death. Poems, songs, and literature were subtly ‘altered’ to fixate on the beauty of death. Young men in training as pilots and soldiers were forcibly conditioned to learn the ‘sakura’ philosophy. The propaganda homogenized the cherry to one variety, the somei-sakura, throughout Japan, despite its diversity of selections. Flowering cherries would not have been Ingram’s obsession had his trajectory as an ornithologist had not been derailed. Ingram grew up the youngest of three boys and was home-schooled, given his sickly constitution. His family’s wealthy circumstances enabled him access to the trappings of high cultured society. The family’s London home was a stone’s throw from the Museum of Natural History, enabling the young boy to engross himself with organisms from faraway lands. Closer at his country home in Westgate-by-the-Sea were natural areas where Ingram happily explored on foot, sketching and studying birds. His drafting skills would serve him well in the future. At a time when the working class mired in poverty, the Ingram’s life was a blissful one. Ingram first visited Japan in 1902 after he forgo the customary Grand Tour of Europe his well-do contemporaries would undertake. The visit would leave an indelible impression on him. Upon seeing the iconic Mount Fuji in the distance, Ingram wrote on his farewell voyage to UK: ‘When the land was behind the horizon this pyramid still shadowed against the evening sky – a lone mark upon the ocean, almost alone in the heavens, alone in the heavens, alone save for a few gilt-edged clouds that sailed in the sea of orange’. He was to return five years later, this time with a bride in tow, Florence aka ‘Flo’ on their honeymoon. While the trip was hardly a holiday for his long-suffering pregnant wife, Ingram availed himself on a mission to study Japanese birds. It was a successful trip, which led to his paper published in January 1908 IBIS, the magazine of the British Ornithological Union. Nearly two decades would pass before Collingwood would return to Japan again. The World War I halted additional trips, and Collingwood was commissioned into the infantry battalion and later the flying corps. While he was fortunate to experience the war without any physical or emotional trauma, he was left like his fellow survivors to contemplate their post-war life. What had been a promising career as an ornithologist was curtailed by what Ingram saw the profession’s overwrought obsession with extraneous details. These details, while somewhat important, diminished the enjoyment of birds and their jubilant birdsong. Ingram turned his attention to another aspect of nature that mattered more: the plants. Fortunately, in 1919 he and his young family had purchased and moved to a home The Grange in Benenden, Kent, approximately 50 miles southeast of London. There was no garden apart from a neglected rose bed and some overgrown clumps of shrubbery. In all, the property was ideal for Collingwood’s vision of a new garden. However, close to the house were two mature trees, probably planted in the mid- to late-1890s by the previous owner’s gardeners. One skirted the west wing and the other the back of the house. The following year, the trees exploded into pink blossoms, leaving Ingram enthralled with their beauty. It was the start of his flowering cherry obsession. Left Image: Seisaku Funatsu in center and Walter Tennyson Swingle in Tokyo in 1918. Seisaku Funatsu was considered the ‘the fountain head of cherry lore’ by Collingwood Ingram. Walter Tennyson Swingle was a USDA botanist who specialized in taxonomy of citrus (Swingle classification is still used for citrus). He collected Chinese and Japanese books on plants, and would make frequent trips to Asia. Photo Credit: Rare and Special Collections, National Agricultural Library. Right Image: The Yokohama Nursery was Ingram’s first call during this third and final trip to Japan in 1926. It was the main conduit through which Japanese plants were introduced to US and western Europe. Modernity had not been kind to flowering cherries in Japan. The feudal system that had cherished and preserved the different cherries was replaced with a Westernized system less forgiving and more ignorant about them. Ingram felt disillusioned about the urbanization at the expense of Japan’s cherished trees during his last visit in 1926. Despite his bittersweet feeling, he persevered in his mission of seeking cherries to import and propagate in the UK. What buoyed his spirits were the meetings with the sakuramoi, the men who were entrusted with the old cherry varieties. One of the imminent sakuramoi was sagacious Seisaku Funatsu who spoke of the trees with fatherly affection. Ingram immediately felt a kinship with Funatsu, and the tacit accord was to be pivotal later. Although not given to public speaking, Collingwood felt compelled to warn the Japanese of the urgent need to safeguard their horticultural heritage. His speech presented before a delegation of Japanese bureaucrats, media, and sakuramoi, unfortunately had little effect. Instead, Japan was busily prioritizing reconstruction after the 1923 earthquake, and political intolerance was building to a feverish pitch. His comment, ‘[However,] in years to come, the Japanese will have to seek some of their best sorts [of cherries] in Europe and America’ was prescient. Prunus ‘Umineko’ inspired Collingwood Ingram to hybridize flowering cherries after he began to amass a collection. He named this chance seedlings after the Japanese word for seagull since the tight clusters of flowers reminded him flocks of seagulls congregating closely together. Back at his home The Grange, Ingram made an imperative decision to collect, propagate, and disseminate the flowering cherries throughout UK and in order to bring them back to Japan. Cherry scion wood were requested and arrived from his Japanese sources. Collingwood was able to perfect his grafting techniques for higher rates of success, and soon The Grange become an unofficial clearinghouse for seeds and scions throughout Europe, Japan, and United States. Ingram began to breed flowering cherries after being inspired by a spontaneous seedling in the garden. When this seedling finally flowered, it produced spectacular perfectly formed white flowers and was named ‘Umineko’, Japanese for ‘seagull’. The possibilities seduced Ingram to make deliberate crosses between his plants. Today we have him to thank ‘Okame’, a hybrid of Prunus incisa and P. campanulata, which grows as a street tree in my city Philadelphia. It is the earliest to flower, making it prone to late spring frosts here, but the showy red sepals prolong the show after the dark pink petals drop. Prunus ‘Okame’ remains Collingwood Ingram’s most popular introduction in the nursery trade. It was the result from crossing the seed parent Prunus campanulata (Taiwan cherry) and the pollen parent P. incisa (Fuji cherry). Ingram’s cross done in 1940s would not have been feasible with the Kew’s ‘contribution’, an amusing story that Naoke narrates in her book. While flowering cherries were his first love, Ingram was interested in other plants. Rhododendrons were another specialty, which he hybridized as well. Hydrangeas, gladioli, and irises and cedars poured in from plant hunting trips in Japan, South Africa, and Morocco. A rosemary named ‘Benenden Blue’ was a happy discovery in Corsica after his chauffeur-driven car collided with a coach. Friendships with Edward Augustus Bowles and Vita Sackville West of Sissinghurst Castle fame ensured a steady exchange of seeds, cuttings, and plants. Although Ingram had not stepped foot on Japanese shores a bit over a decade, the World War II would bring Japan closer to home if the flowering cherries hadn’t. The cherry ideology which sugarcoated Japan’s jingoism would ensnare the Ingram family. Alastair, Flo and Cunningham’s Ingram’s youngest son who was an arm officer, began a relationship with a British military nurse, Daphne Van Wart, in Hong Kong. Japan’s invasion of China spread to Hong Kong where the Japanese forces stormed and inflicted causalities. Daphne would spend three years as a prisoner of war, subject to hardships under her Japanese captors. Abe’s re-telling of Daphne’s ordeal as a POW, her post-war relationship with her father-in-law Ingram, and the posthumous denoucement adds a poignant layer to that of Abe family’s story. The war itself did little to interrupt Collingwood Ingram’s work with cherries, although Benenden, being within the warpath to London and German cities, was constantly barraged with the droning airccraft and aborted missiles, which largely killed livestock. Ingram carefully gathered his observations and illustrations into a seminal monograph Ornamental Cherries, which was published in 1948. Dedicated to ‘all who have planted cherry trees, whatever their creed, caste, or colour may be,’ the book covered cultivation, taxonomy, and cultivars. Ingram delivered honest appraisals of the cherries, being laudatory of some for their fragrance or the flower form while critical of some for weak constitution. The timing of Ornamental Cherries was a propitious one that coincided with the post-war interest in flowering cherries and their popularity in landscapes. The royal family’s love for cherries did not hurt either, as the Crown Estate’s Windsor Greek Park become the recipient of Collingwood’s generous gift. As Ingram advanced into his twilight years, he continued to receive visitors. 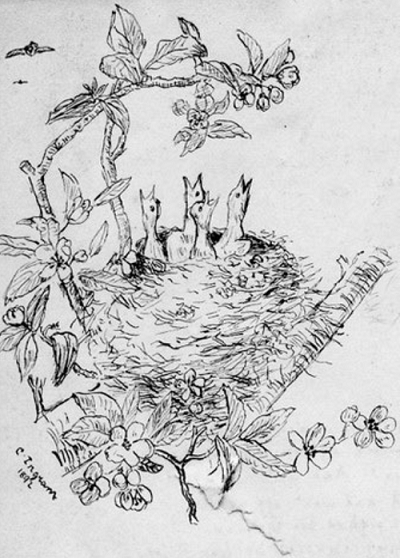 His attention on cherries was no longer ardent as it had been before, and ornithology returned again as his interest ever since he was a young boy sketching eggs and nests. Those nightingale nights, however, were a faded memory, given the precipitous decline in the bird numbers. Ingram had always kept diaries detailing birds and wartime experiences from which he drew for his books. Ingram published two reminiscences In Search of Birds in 1966 and A Garden of Memories in 1970. His last book The Migration of the Swallow was published in 1974 when he was in his nineties. Flo’s death in 1979 left him emotionally shattered and more physically frail. 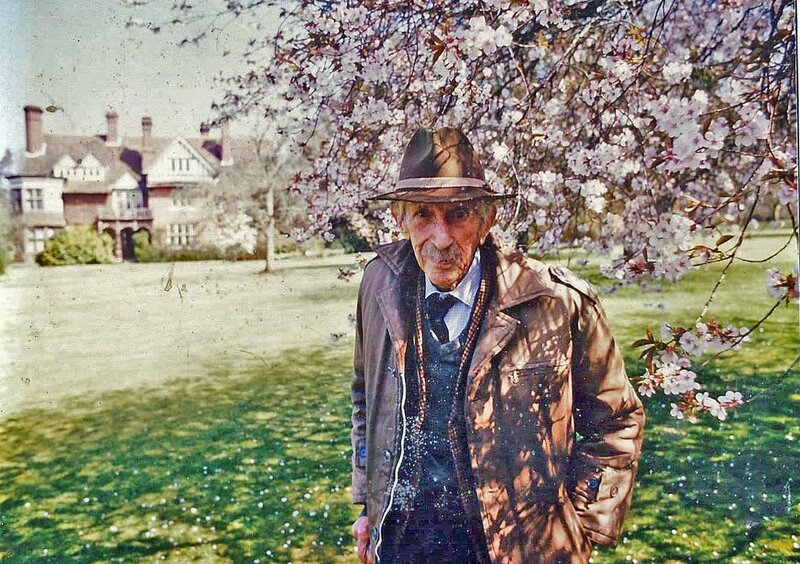 Ingram passed away peacefully in his sleep two years later, nearly seven months after celebrating his 100th birthday.